The Hotel Iberostar Papagayo is located on the coastline of Playa de las Coloradas, near the hugely popular resort of Playa Blanca in Lanzarote. This hotel is especially designed for families and children looking for a relaxing holiday in the Canary Islands. 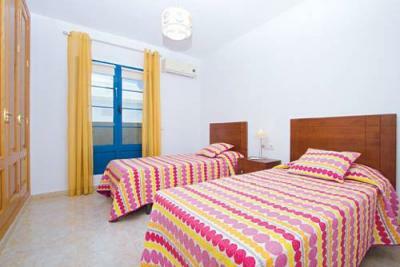 Its quiet location, alongside its close proximity to Playa Blanca make it an ideal destination. Overlooking Playa de las Coloradas, on Lanzarote, this hotel offers spectacular coastal views of the Canary Islands and offers a quiet location in which families can relax. Guests can enjoy the natural, rural scenery or enjoy the nearby entertainment, including restaurants, shops and bars. The hotel offers a wide variety of dining options that feature both international and traditional dishes from the Canary Islands. This includes a number of cocktail bars, where guests can enjoy live shows, a buffet restaurant and a poolside snack bar. There are plenty of children's services, including a Mini Club, games room and disco. Parents can also choose to use the hotel's babysitting service if required. The Hotel Iberostar Papagayo has 291 guest rooms, some of which are especially designed for families and have sea views. Guests can also choose to stay in junior or senior suites. Rooms feature air conditioning, bathroom and a terrace as standard. There is also wi-fi, a safe, satellite TV and a mini bar on request. Breakfast fruit juice very poor quality & disappointed no hospitality tray in room, and not available to rent at reception. Super hotel with lovely staff and so relaxing to be there. Muy buen hotel y sus instalaciones. Destacar el personal en general, recepción, camareros, limpieza, fabulosos, amables. El todo incluido es muy bueno, tienen bastantes marcas premium, el resto aceptables, variedad en las comidas, calidad, desayunos generosos, cenas temáticas, etc. El entorno en esa zona es tranquilo, el paseo te lleva hasta playa blanca, precioso y relajante. Tienen un servicio de bus gratis al pueblo. Buena wifi. Resumiendo fue un acierto y gracias a central reservas una vez mas el mejor precio del mercado. Muy buen hotel, estancia muy agradable. Personal muy amable, muy buenas instalaciones.